Rev. Gay Clark Jennings, president of the House of Deputies, speaks out on the Heather Cook case. Meanwhile, Presiding Bishop restricts Cook. Above: Gay Clark Jennings, president of the Episcopal House of Deputies. 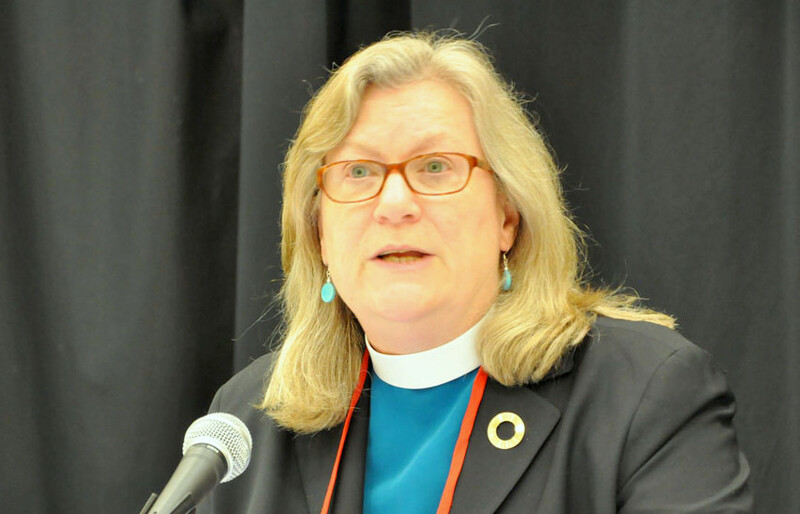 Saying that the Episcopal church should do more than investigate the Heather Cook case alone, a national leader has called for a review of the way bishops are selected and the church’s policy on alcohol and drug abuse. Rev. Gay Clark Jennings’ statement, published yesterday, acknowledges the questions that have reverberated in Episcopal circles in the wake of the news that Cook, a recently-consecrated bishop in the Maryland diocese, fatally crashed her car into a bicyclist in Baltimore while allegedly drunk and texting, initially leaving the scene of the crash. Four years before, while a church official in Easton, Md., Cook was arrested on DUI and drug possession charges. Last week, her superior, Maryland Bishop Eugene Taylor Sutton, revealed that just two nights before her consecration, Cook appeared to be inebriated. Her September 6 consecration ceremony proceeded as scheduled. “Many people in the church have struggled to understand better how our systemic denial about alcohol and other drug abuse in the church may have contributed to Bishop Cook’s election and confirmation as a bishop even as she seemed to be struggling with addiction,” wrote Jennings, president of the Episcopal Church’s House of Deputies, which is composed of representatives from clergy and the laity. “Many Episcopalians are asking what people in positions of authority in the church knew about her history of addiction and driving while under the influence of alcohol,” Jennings wrote. With Cook facing charges of automobile manslaughter, driving under the influence of alcohol and leaving the scene of an accident, the criminal case is moving forward. The national church’s so-called Title IV investigation of the bishop’s conduct is also underway. With the Episcopal Church thrust into the harsh glare of international media coverage in the wake of the crash, clergy and laity have been hotly debating the need for changes in governance and leadership, as well as calling for a rethinking of attitudes to alcohol abuse. “Can a consecration train be stopped?” asked John B. Chilton, in a post on the influential website, Episcopal Cafe, which reminded readers of two derailed bishop candidacies. That same year, Rev. James MacKenzie resigned as bishop-elect for the Diocese of Eastern Oregon. MacKenzie acknowledged publicly that he had engaged in inappropriate e-mail exchanges with four women. There has also been soul-searching on the subject of Episcopal church drinking. Bishop J. Scott Barker of Nebraska publicly declared he would not drink alcohol during the general convention in Salt Lake City and asked for others to support him. The promotion was singled out for criticism by Rev. Anjel Scarborough, of Grace Episcopal Church in Brunswick, Md., writing on her blog that it violates a church policy, approved in 1985, that liquor should not be publicized as an attraction of a church event.